Save $$ buy Premium Elk Antlers Dog Chews in bulk! Our X-LARGE WHOLE Rocky Mountain Gobstoppers Elk Antlers for Dogs are cut from premium quality, Grade-A naturally Shed Elk antlers. The average XL-WHOLE Chew is 12 ounces, so typically a 2 pound order yields approx. 3 X-Large Whole Chews. 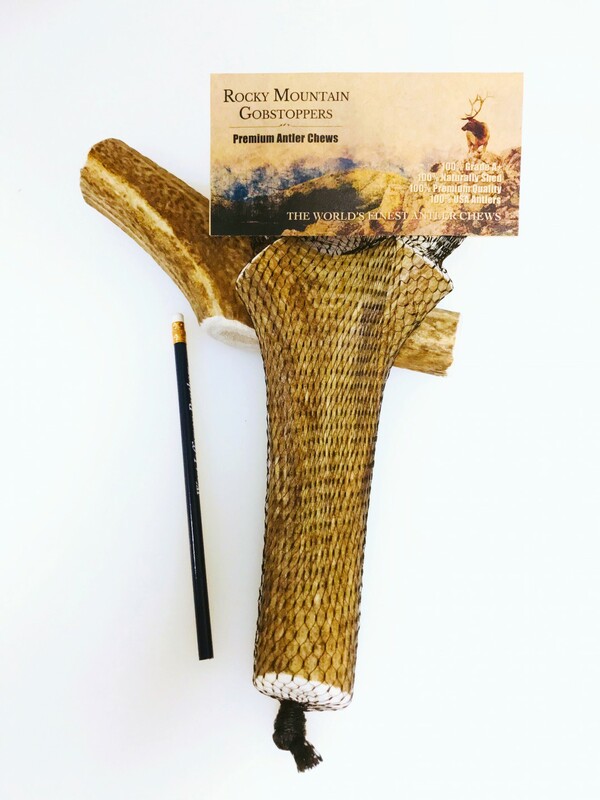 With elk antlers there is only 1 Ingredient, antlers are an annually renewable resource containing no artificial or added Hormones, Antibiotics, Animal By-Products, Steroids or Preservatives. 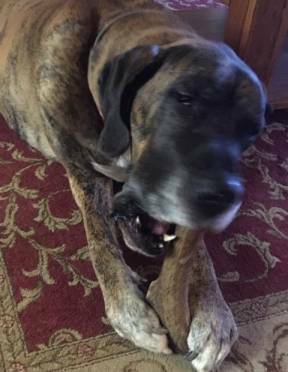 Bought for Great Dane - excellent size and price compared to other companies we have used. Duke Thanks You very much. I am happy to have found a dependable place to buy these from and be able to pick the size I want, I have ordered a few times and have never been disappointed, these are exceptional chews. The dogs love them. Opened the box thinking it would be the same small pieces as the rest and my dog would be done with in a day. 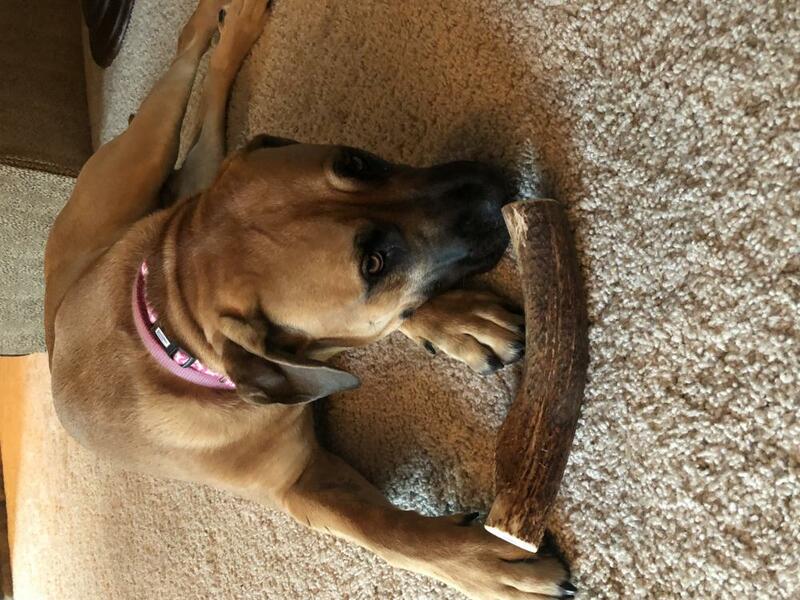 To my suprise there were two big beautiful pieces of antler and a week later she is still chewing on the first piece. 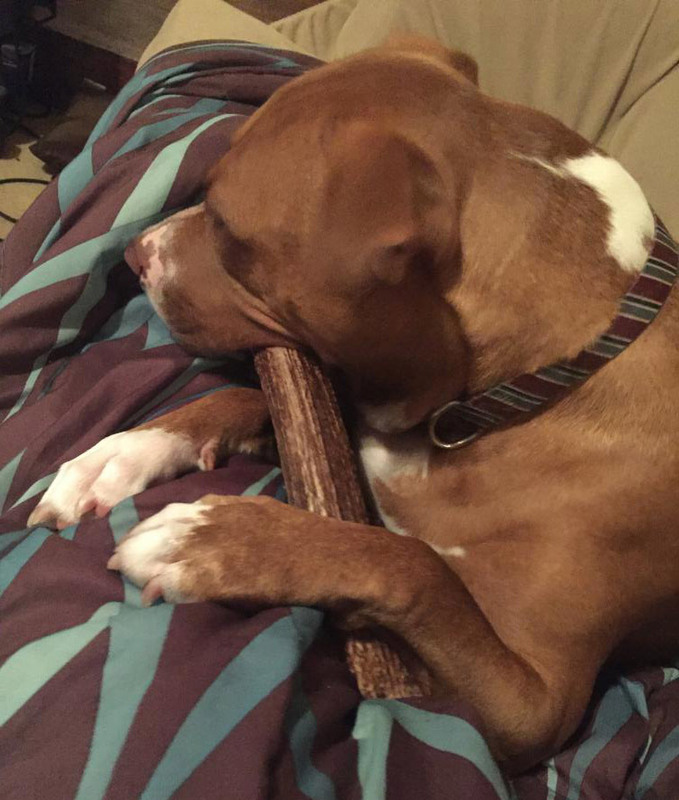 Thank you for keeping a heavy chewer busy!! My babies LOVE your antlers! This is the 4th time we have purchased your product and each time the quality has been amazing! Keep up the great work! 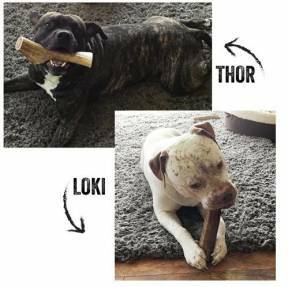 Our boys LOVE your antlers!!! Received antler extremely quick. Easy transaction, GSD loves it. Clean, odor free and great product. Would highly recommend. My 14 month old pit baby loves it so far!! She has had it almost non stop since it got here earlier today. 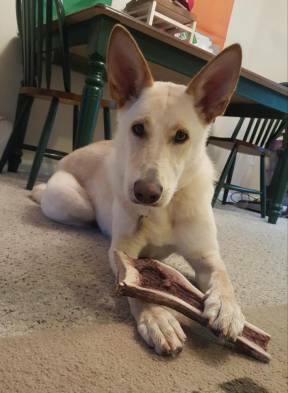 Considering she destroys all toys & ropes with an hour and store bought antlers and horns are no where near as thick, I don't see myself worrying with the pet store for those items in the future. 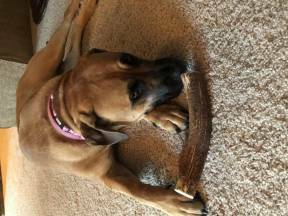 It costs more than what you spend at the pet store, but if you are tired of wasting money for your heavy chewer, I'm gonna go ahead and say it's worth it! Our German Shepherd Lola loves her antlers! She tears through any other chews and toys in no time. Finding these antlers at an affordable price was a wonderful find for us because large antlers are the only thing we can trust our aggressive chewer with. The antlers came in 2 days, along with a handwritten thank you on the invoice. They are great quality and the extra large is the perfect size for Lola. We are happy to support a family business and will be supporting Don and family again! Better deal than my local pet store by far. It even looks to be of better quality. shipping cost kind of a bummer. My 89 lb. Shepherd went thru PetCo and Pet Smart antlers in a week. 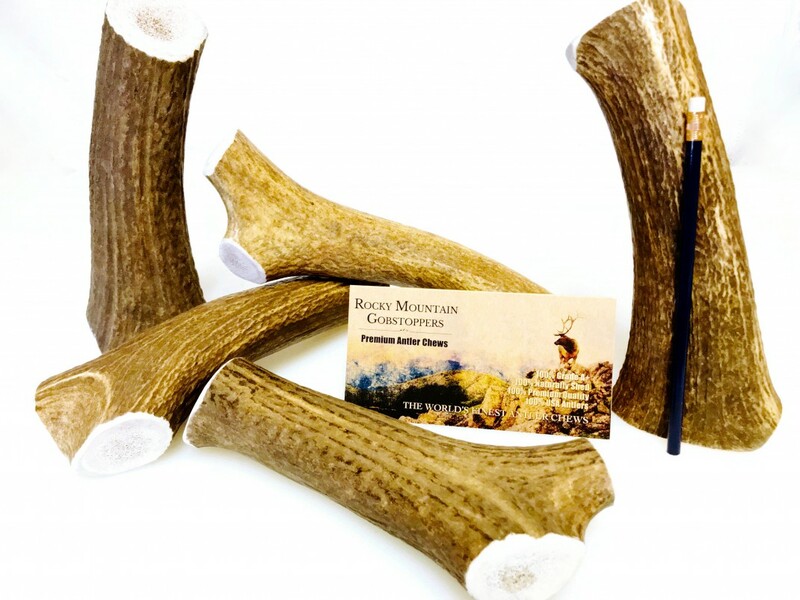 I received a whole antler in late Nov. $40 including shipping. There is about 4 1/2 inches left but time to renew. 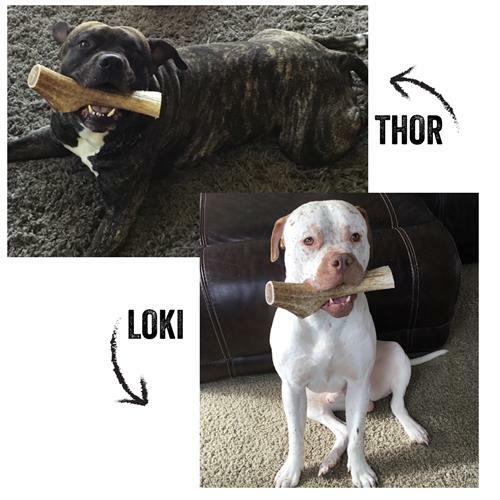 We shopped around on the internet and found Elk Antler dog chews.com after visiting several other sites. Took a chance and are so glad we did. 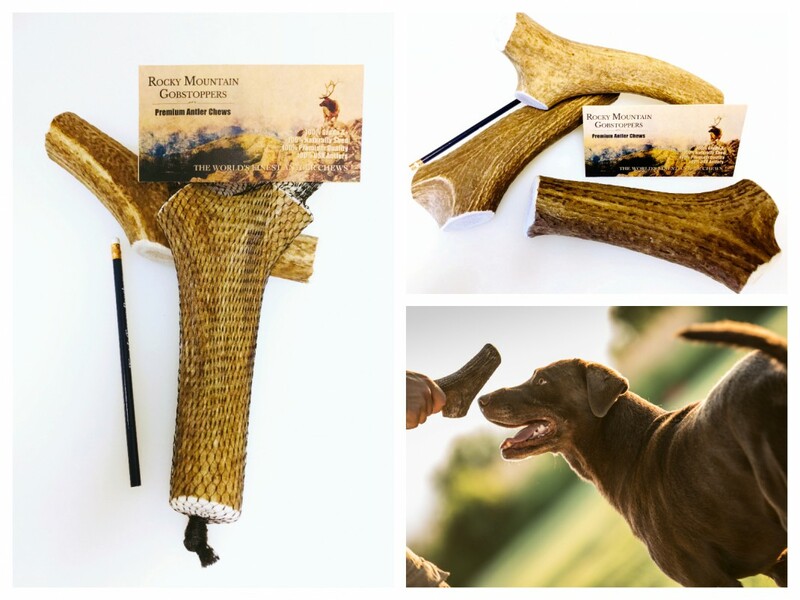 We ordered the X-Large whole Elk Antler dog chews. Our 45lb lab mix (10yrs) and 27lb Beagleman (1yr) were going through rawhide bones like crazy. We are so impressed with the quality and the size is exactly as advertised. We plan on purchasing more for Christmas gifts. Out dogs love them. The only reason we went with X-large is because the dogs are big chewers. We have had them 3 days and so far so GOOD! 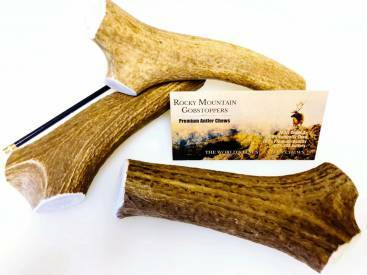 I recently ordered 2 pounds of the XL Whole Elk antlers. I live in PA, and they arrived in 3 days, which was impressive. When I opened the package, they were beautiful and much larger than I had expected. 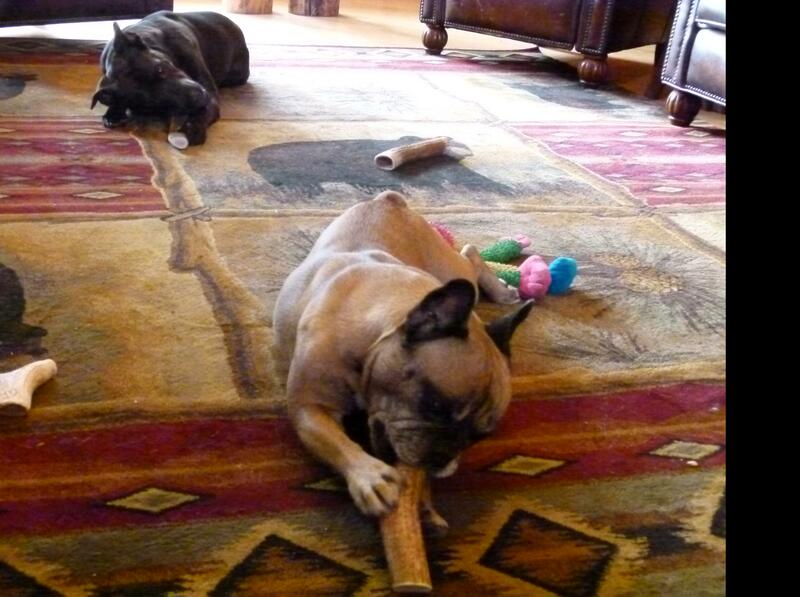 The best part was that I got 3 antler sections for half the price I had been paying at Pet Smart! Thank you so much! My Boxer loves them!! !